Every now and then COPA Airlines will drop the price of their flights from Toronto to Porto Alegre, Brazil down into the $600s CAD roundtrip including taxes. 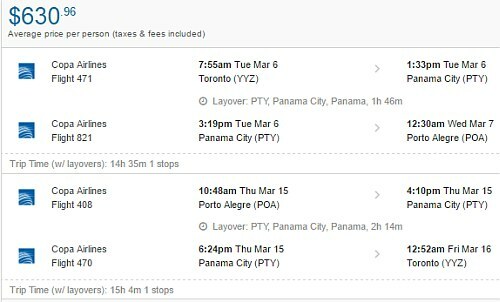 The problem is, they usually drop the price of the flights that have a 12 hour layover in Panama City. However, today they have dropped the price of the flights that have the ideal 2 hour connection in Panama City. 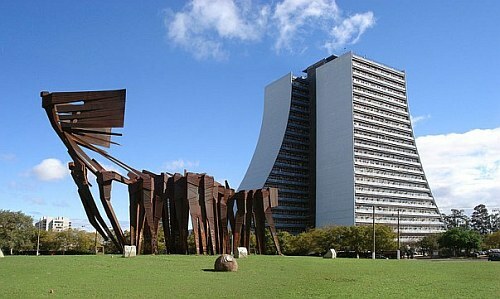 Porto Alegre is one of the wealthiest cities in Brazil, and has the highest literacy rate (97%). Flights from Toronto to Brazil have been very expensive for quite a while now. These flights are about half the price of the next cheapest flights to anywhere in Brazil. ^^ You need to depart by the end of May. Look for the dates that are $676 roundtrip. For trips longer than a week to 10 days, try mixing and matching the dates from different lines in the list below. toronto, yyz, flight deals, south america, brazil, porto alegre and poa. One Response to "Toronto to Porto Alegre, Brazil - $629 CAD roundtrip including taxes"